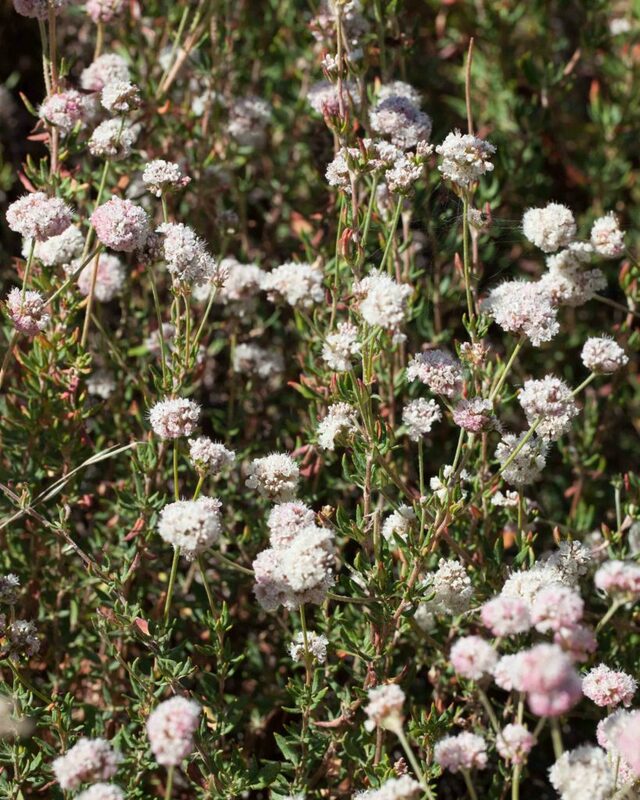 Flowers in this family do not have separate petals and sepals. 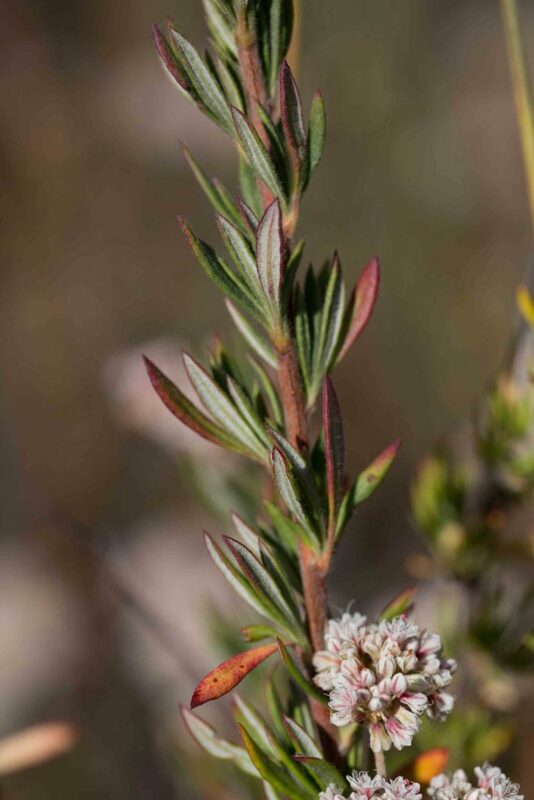 Where this is the case, the term “perianth” is used to describe the flower (i.e. the calyx and the corolla together) and “perianth parts” to describe the individual elements, whether or not they are distinguishable. 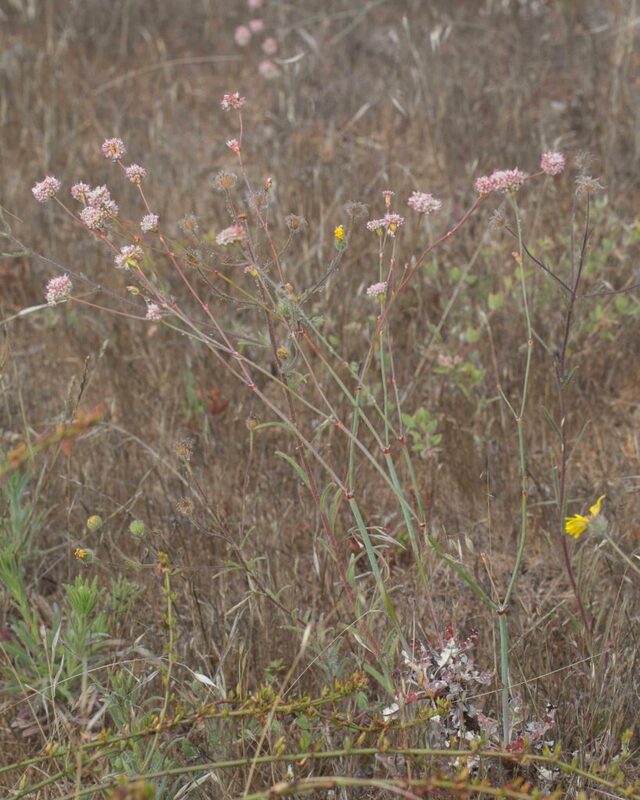 Buckwheats are a very large and diverse group of plants, almost 40 different species found in Monterey and almost 120 species (not counting subspecies and varieties) in California as a whole. 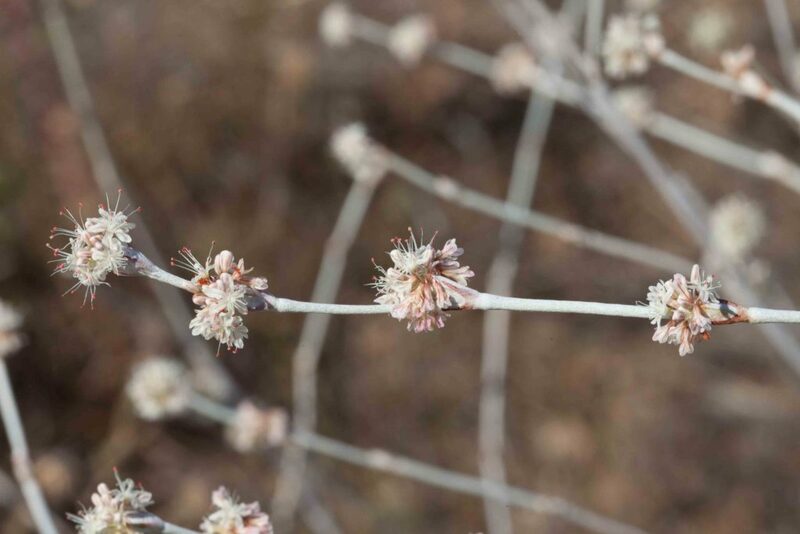 Not surprisingly, identification can prove challenging and the widely varying leaves and growth habits can prove more helpful in the identification process than the often similar flowers. 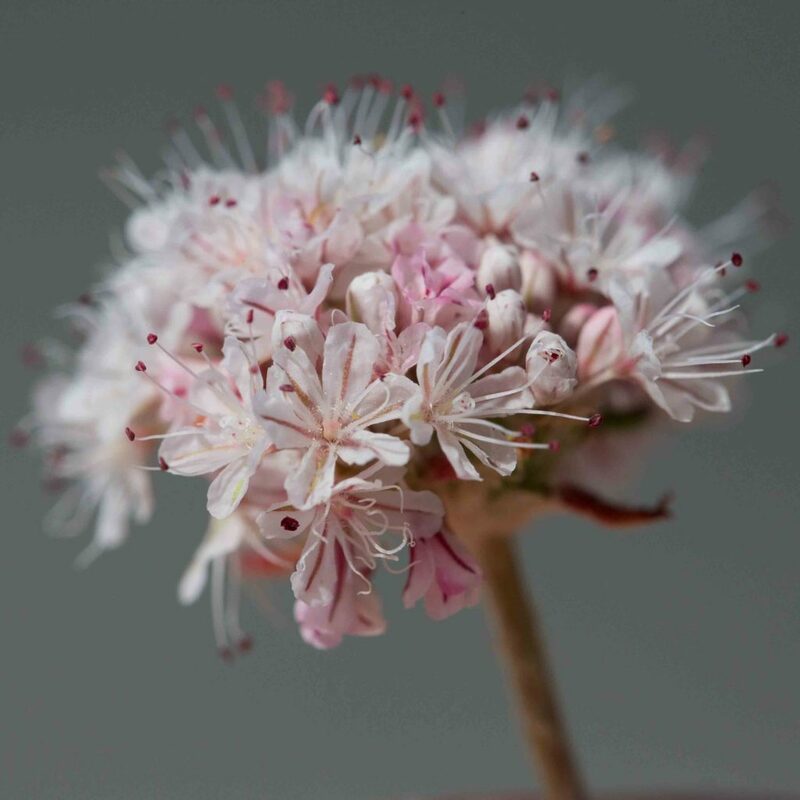 Beyond a certain point, a good botanical key is indispensable. 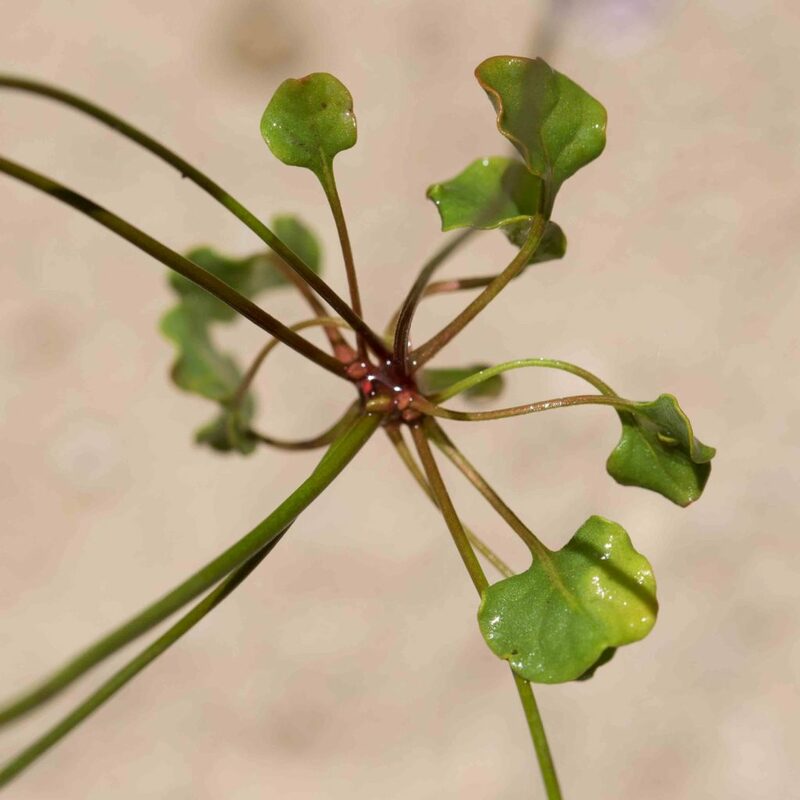 This is a fairly small plant distinguished by the roundish shape of its small basal leaves with their comparatively long petioles. 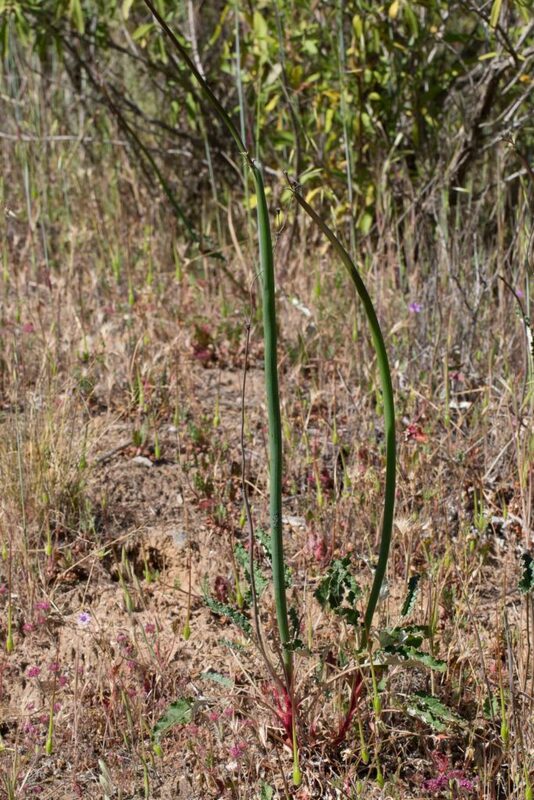 Stems are glabrous and involucres cylindrical to top-shaped. 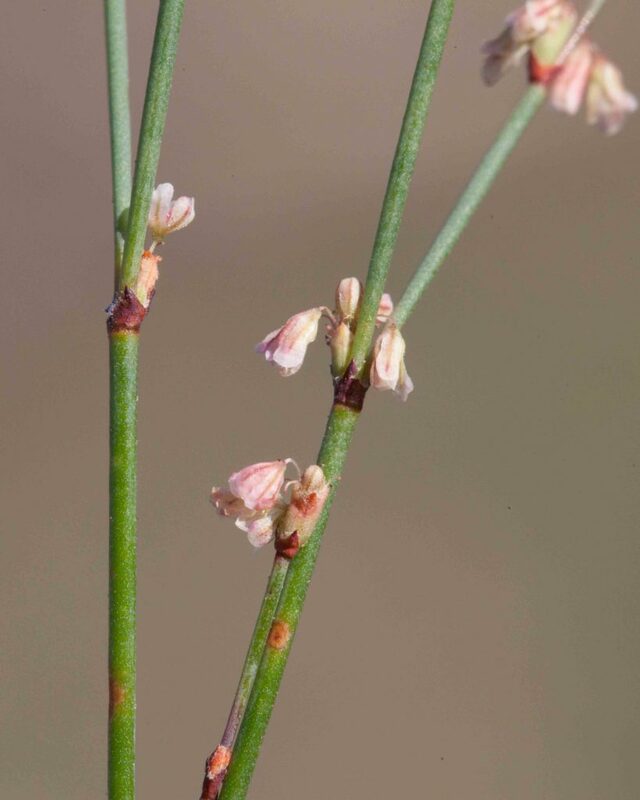 The tiny flowers are found in the stem axils and nodes. 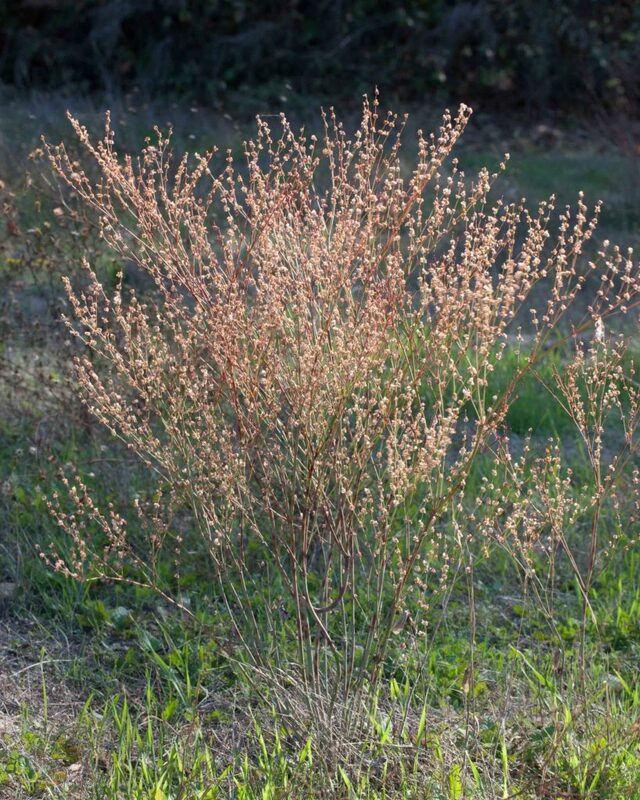 This is a fairly small plant with many slender, branching stems. 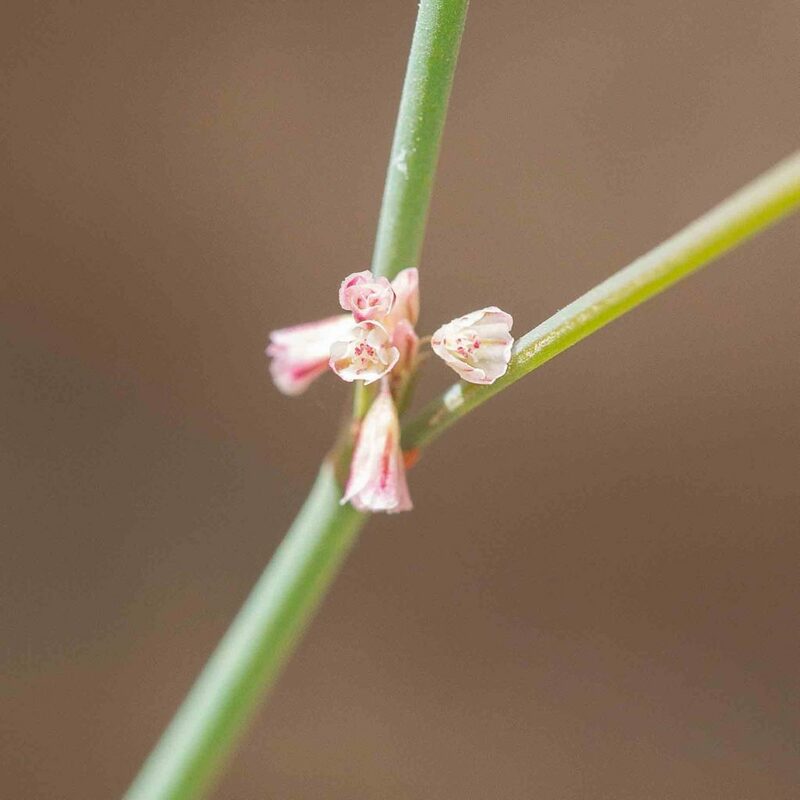 Flowers are tiny, each with a distinct pedicel and borne in small clusters in stem axils, along and at the tip of the stem. 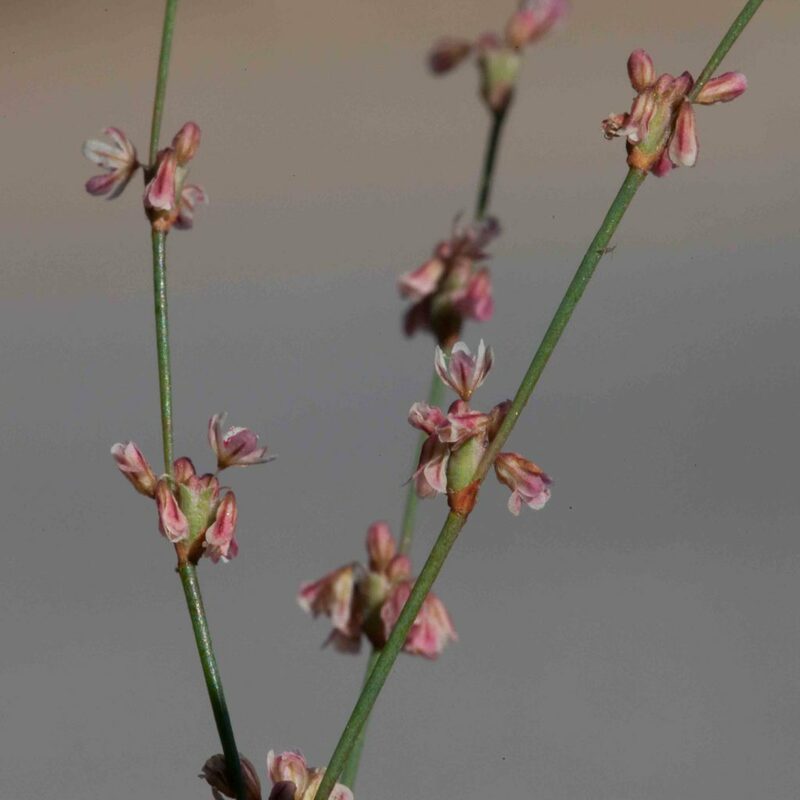 The stems are glabrous and green or reddish. The involucre is small, 1–1.5 mm long. 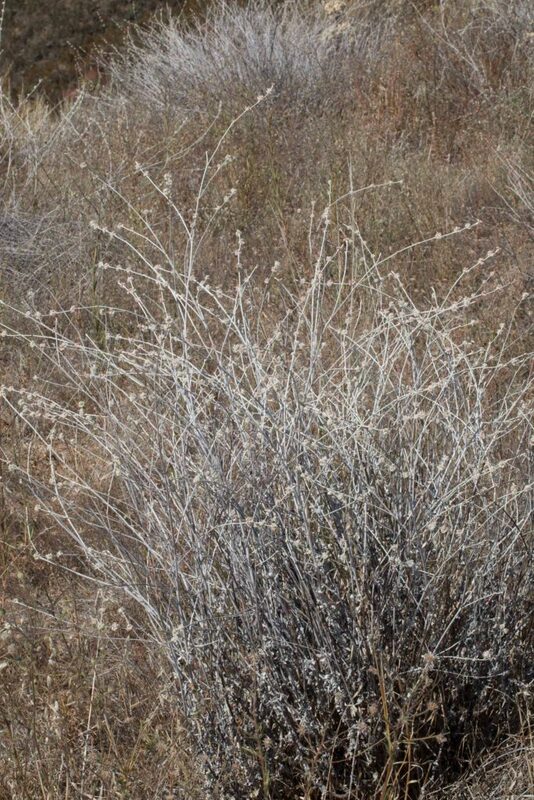 This is a dense, somewhat tangled shrub, grayish-white in appearance and much branched from the base. 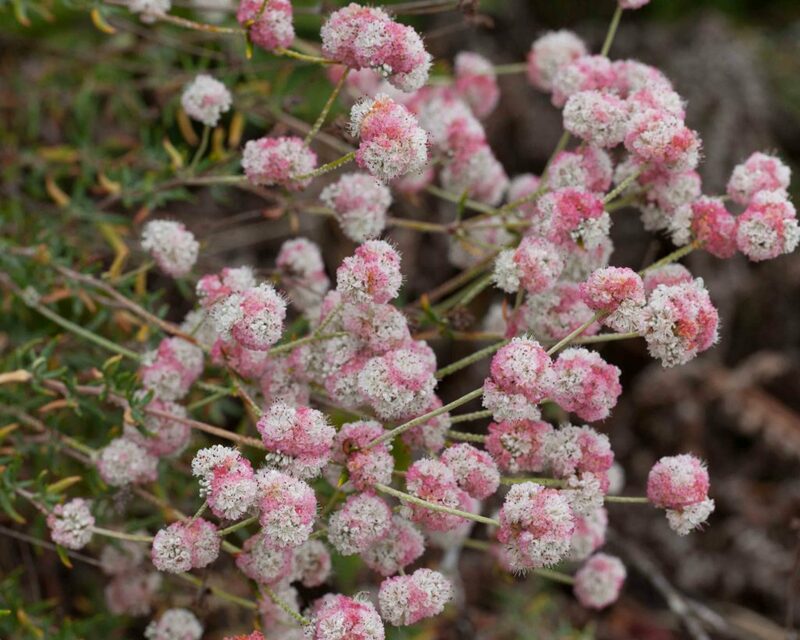 Flowers are pink-tinged creamy white, located laterally in small spherical bundles at stem nodes. 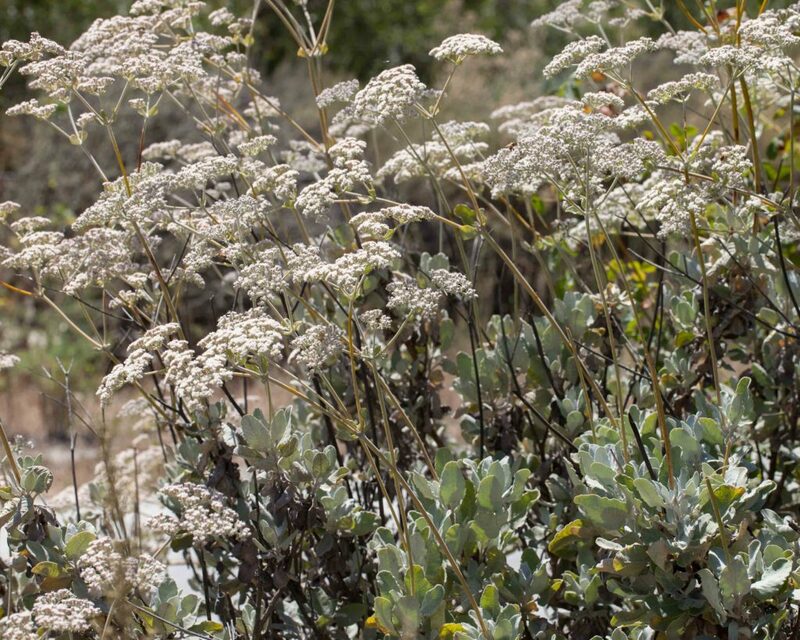 The stems are densely tomentose — hence their whitish color. 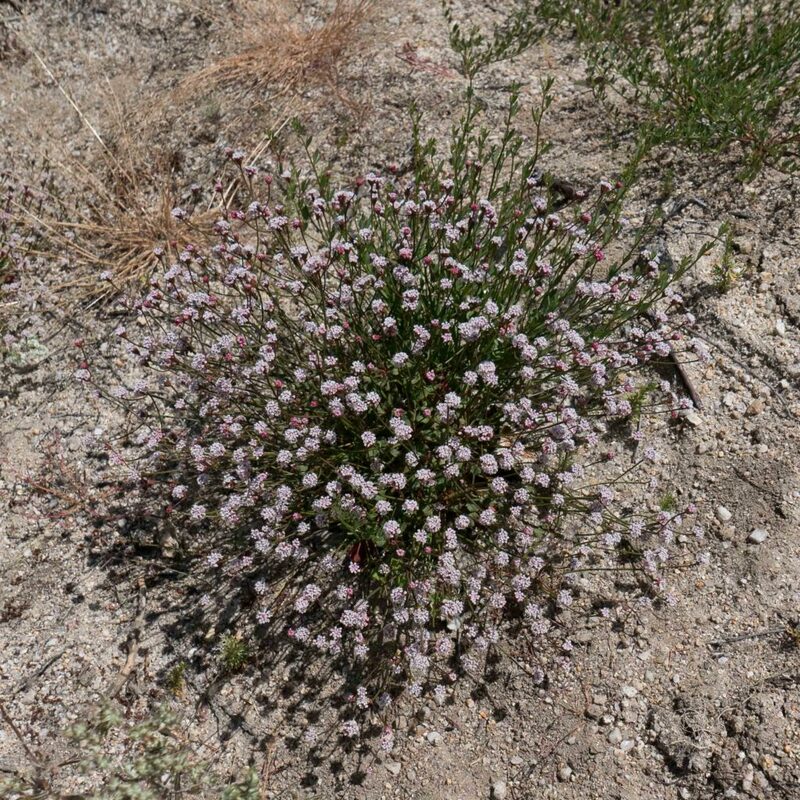 Common (and often planted along roadsides) and easily recognized by its hairy flowers and clustered (fascicled) linear to oblanceolate leaves. 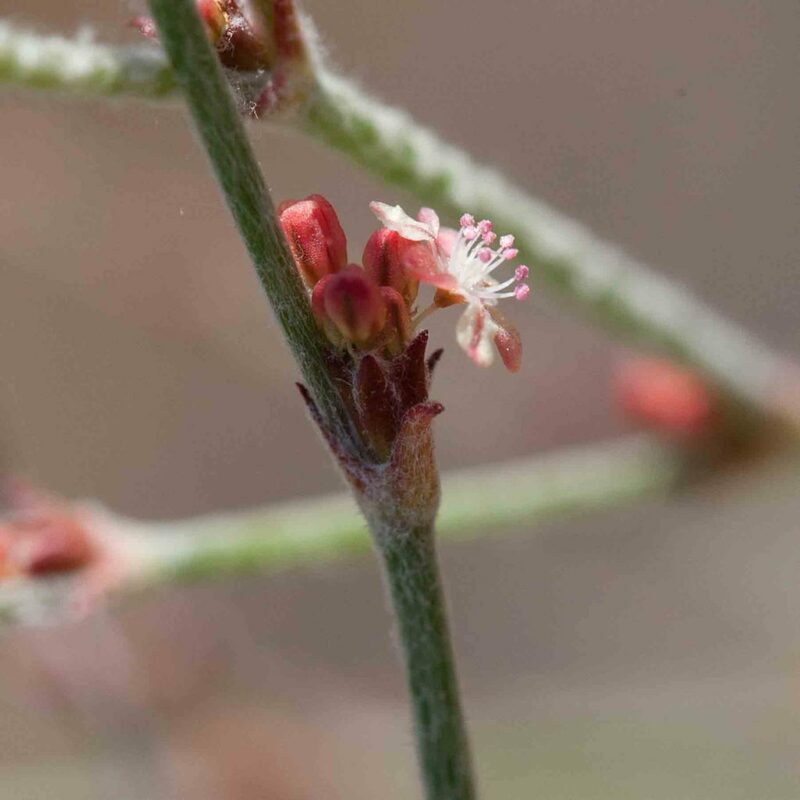 Flowers are in clusters at stem tips and nodes. 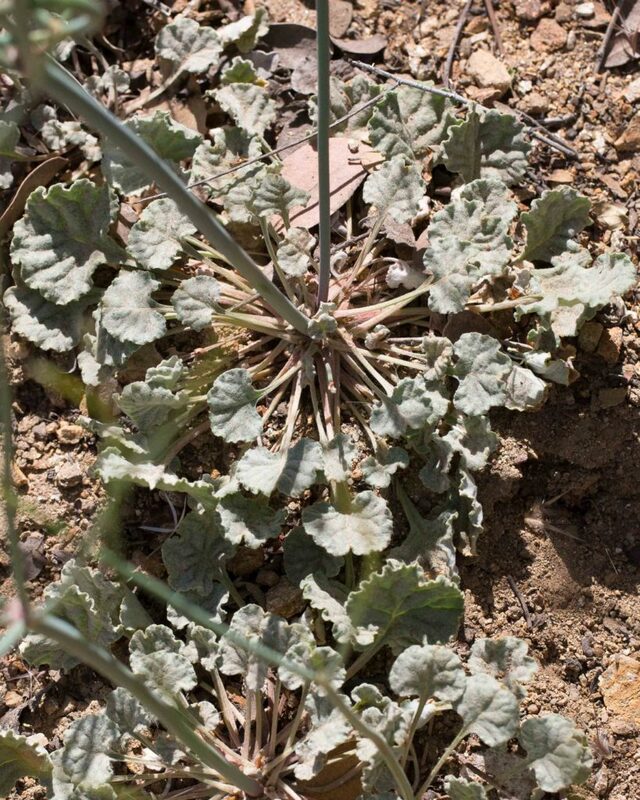 Leaves are small (6–12 mm long and < 4 mm wide), green to sparsely pubescent above and densely tomentose below. Leaf margins are strongly rolled under. 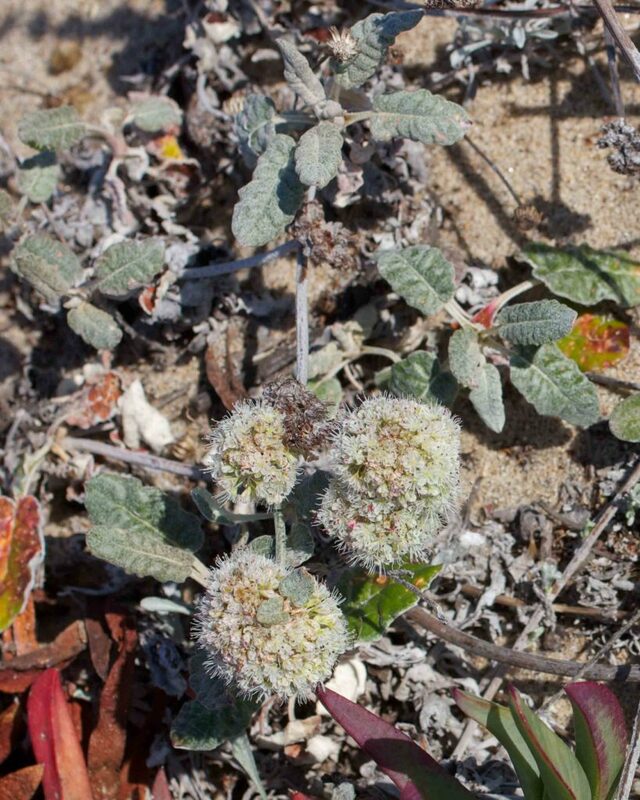 This may be confused with some forms of Seacliff Wild / Dune Buckwheat (see below). 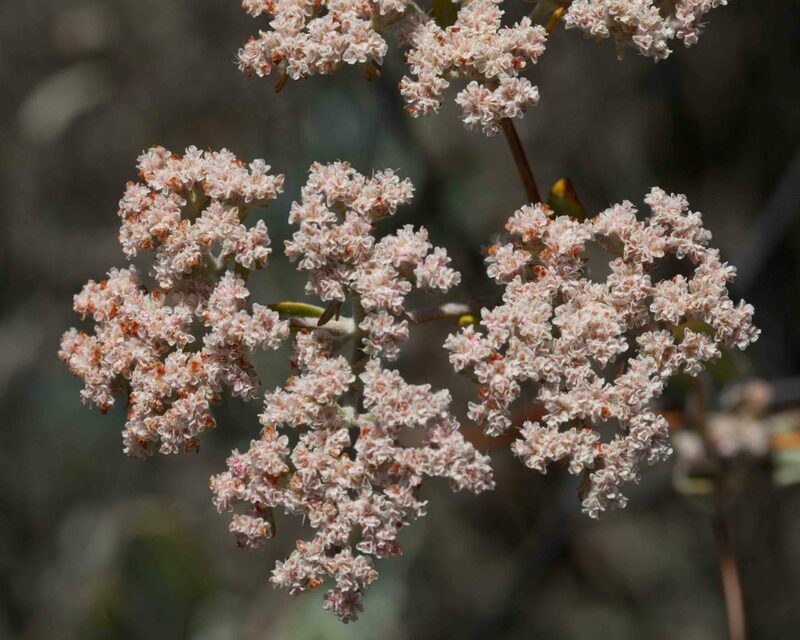 This large buckwheat has large flowerheads with an umbel-like appearance. 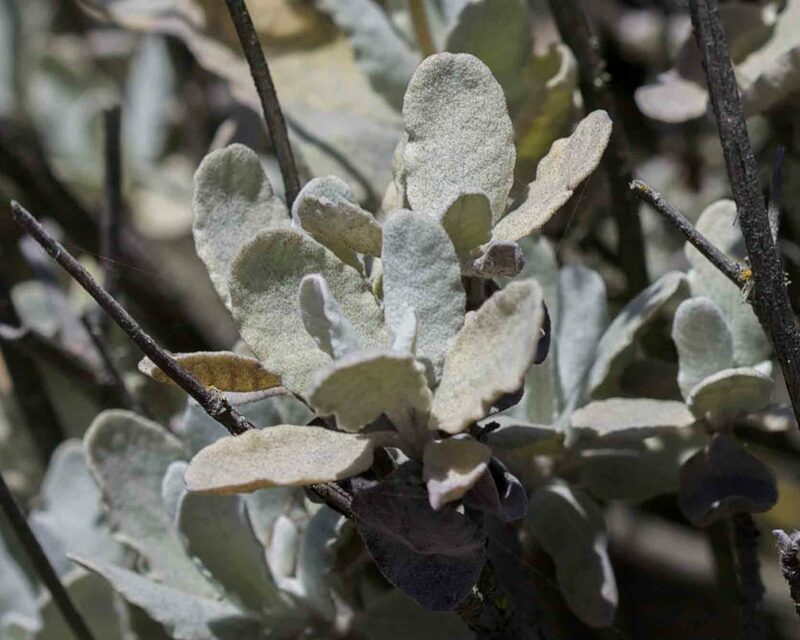 It is most easily recognized by its thick felty leaves. 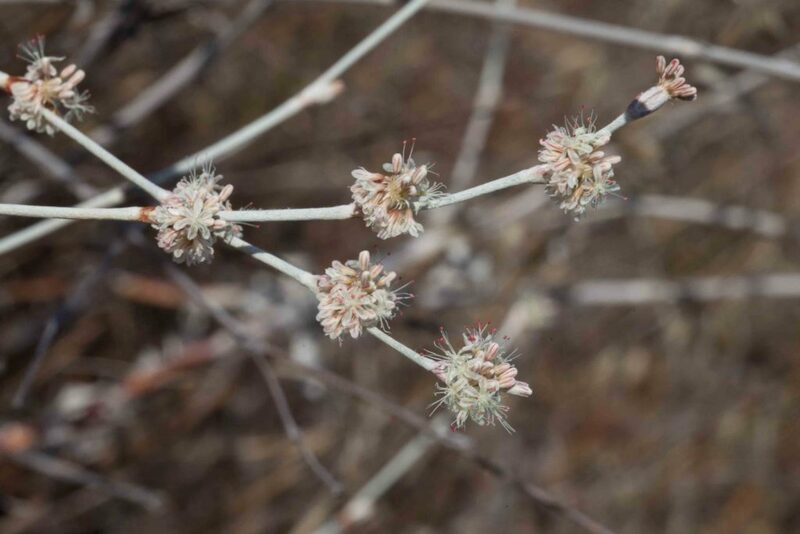 The individual white to rose flowers are more loosely clustered than with most other buckwheats. 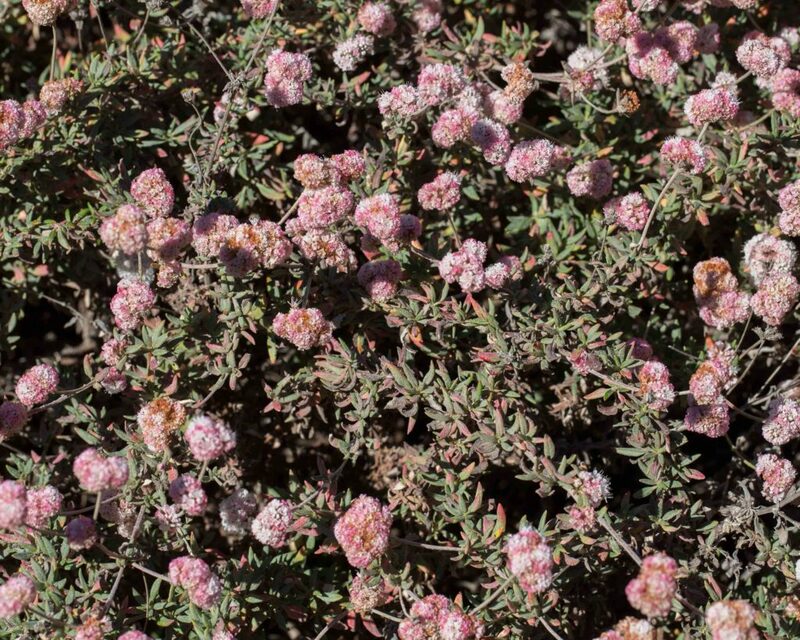 A southern California native, it has been widely planted and is regarded as invasive in Monterey. 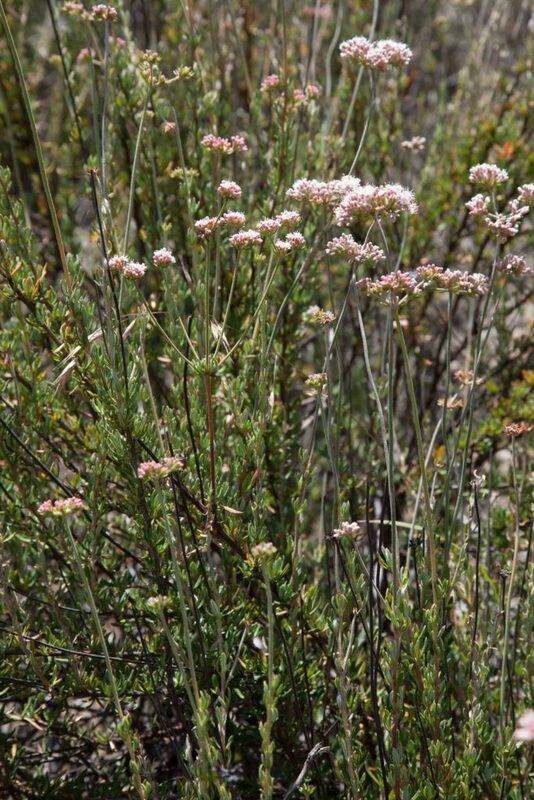 Like Elegant Wild Buckwheat (Eriogonum elegans), this is a smallish plant with many slender, branching stems. 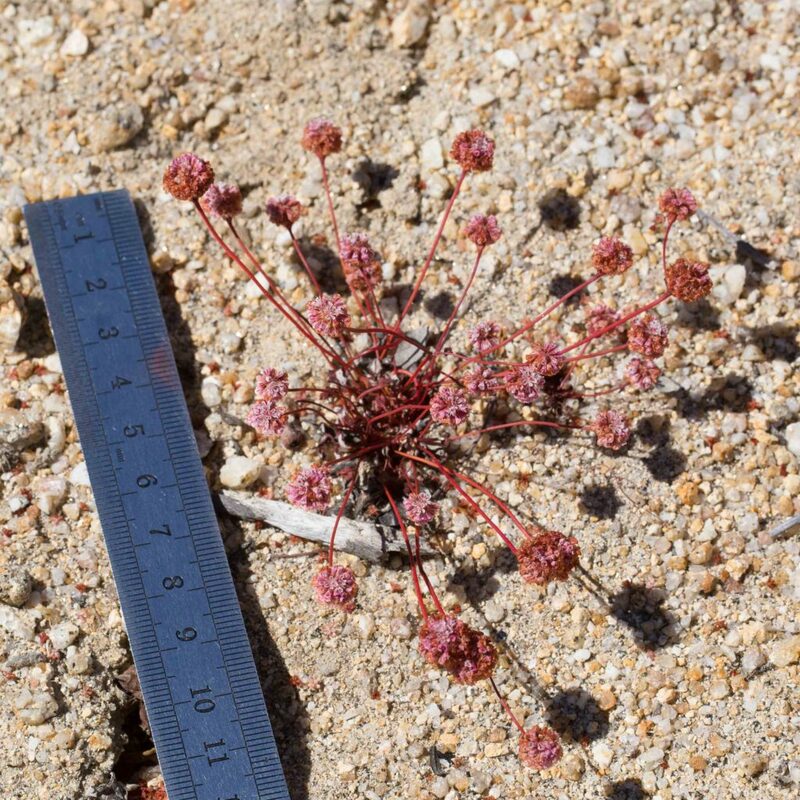 The flowers are tiny, each with a distinct pedicel, and borne in small clusters in stem axils, along and at the tip of the stems. 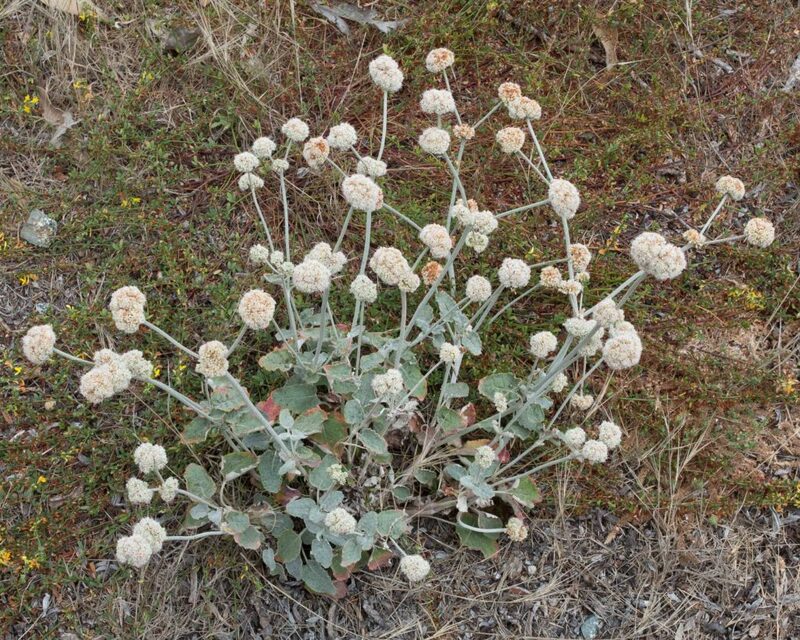 It is distinguished by its tomentose stems and its larger (2–5 mm long) involucre. 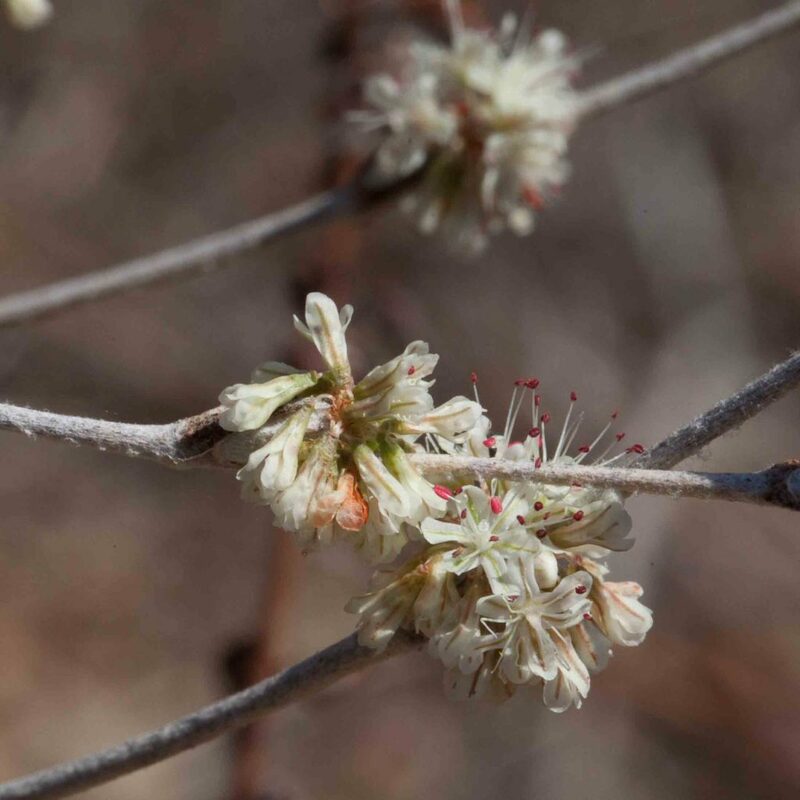 The basal leaves are mostly withered by blooming time. 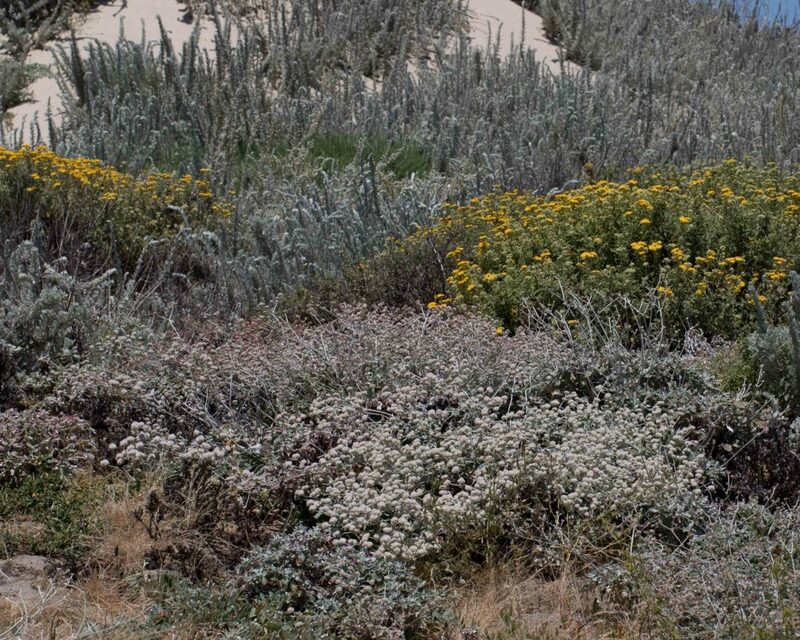 Very common in immediate coastal areas, this is variable in its appearance, depending on habitat and exposure. 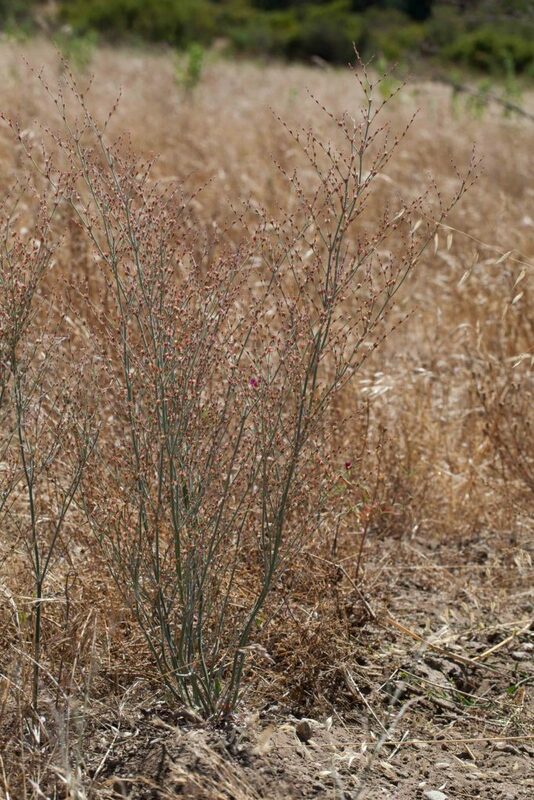 It is often low growing and spreading but the stems may be erect and as much as 70 cm tall. 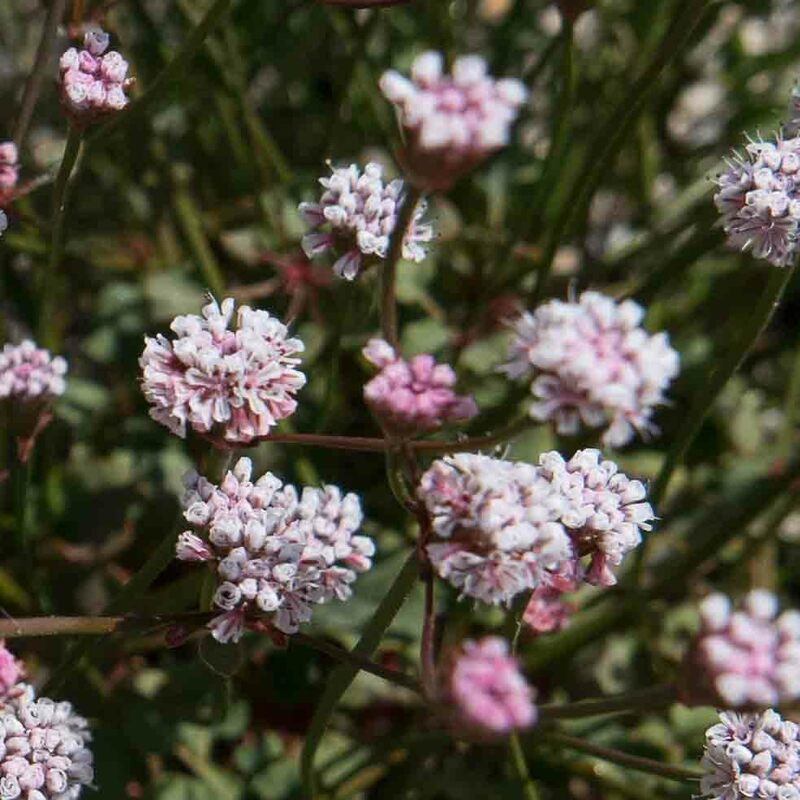 Flowers range from white to pink, in characteristic buckwheat spherical clusters, growing in axils and at the stem tips. 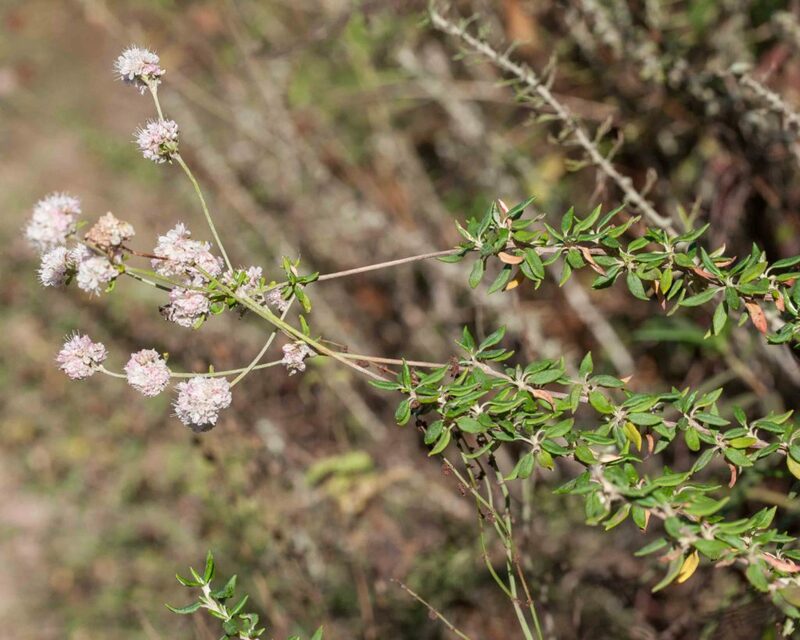 Leaves are generally tomentose, up to 5 cm long and 4 cm wide, pale grayish-green in color. 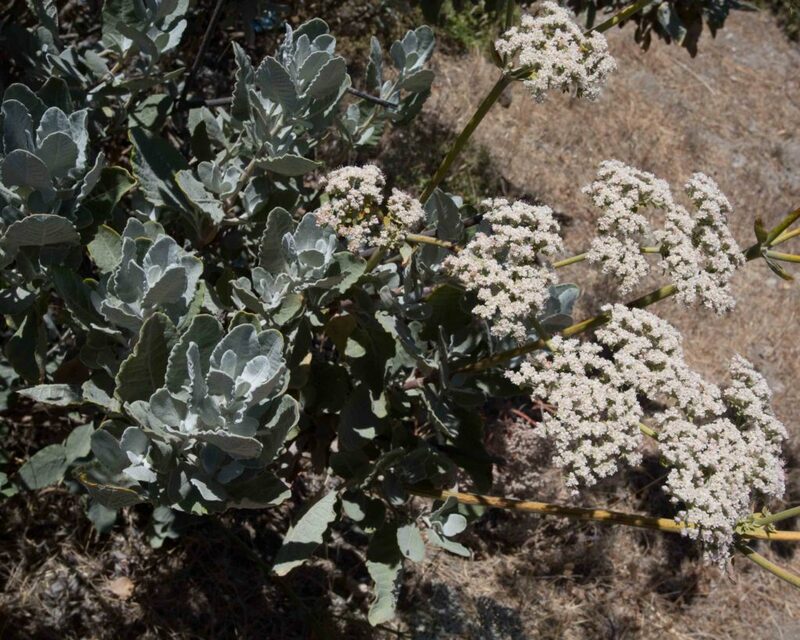 This plant is one of the favorite food sources for the endangered Smith’s Blue Butterfly. 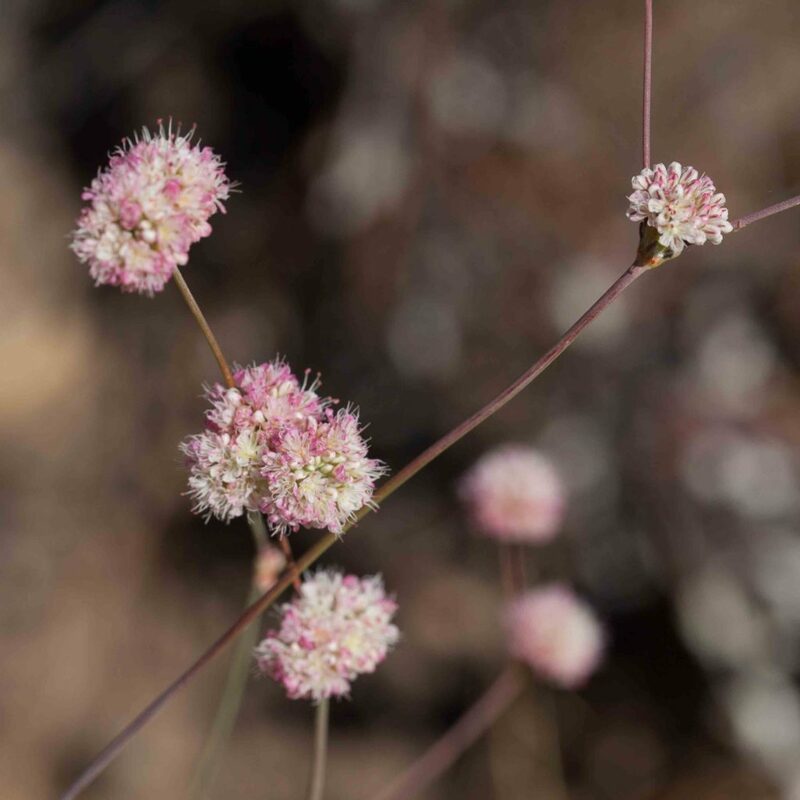 This is a diminutive and rare buckwheat, found almost nowhere outside northern Monterey County, the Pinnacles and Fremont Peak. In normal conditions it tends to be very small and scruffy. 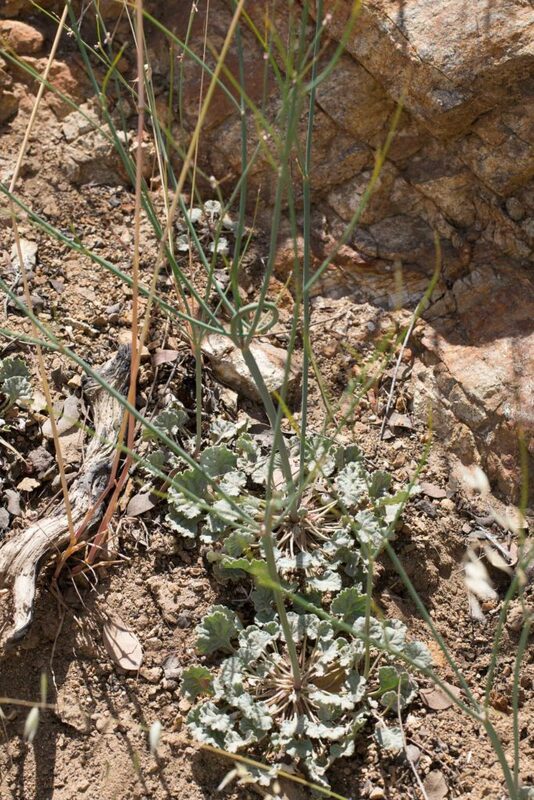 In good conditions or following a fire it produces a much lusher, denser plant, though still very small. 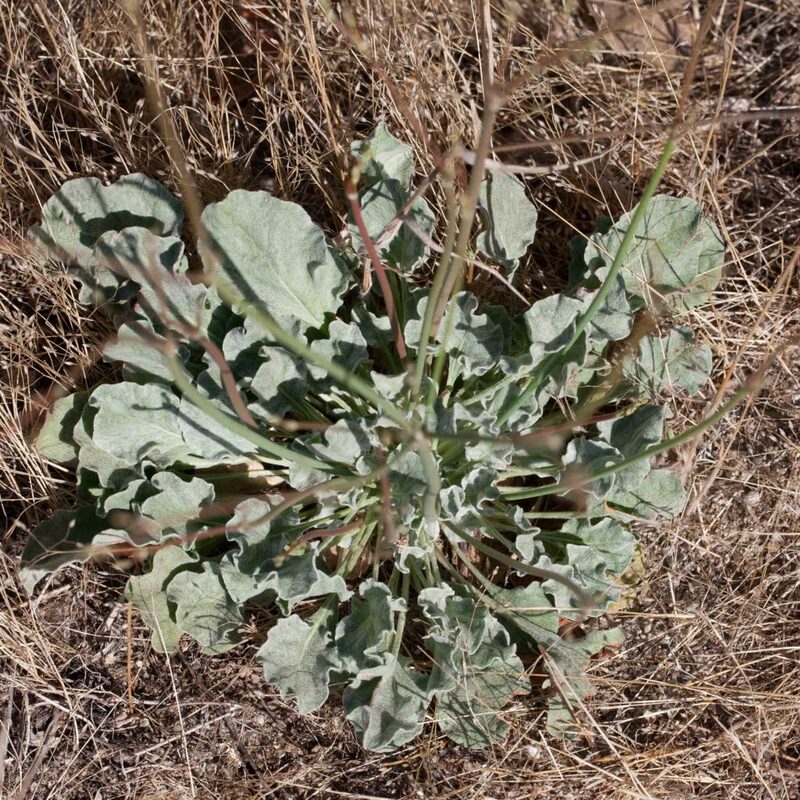 Leaves are 5–15 across, roundish and tomentose on the lower surface. 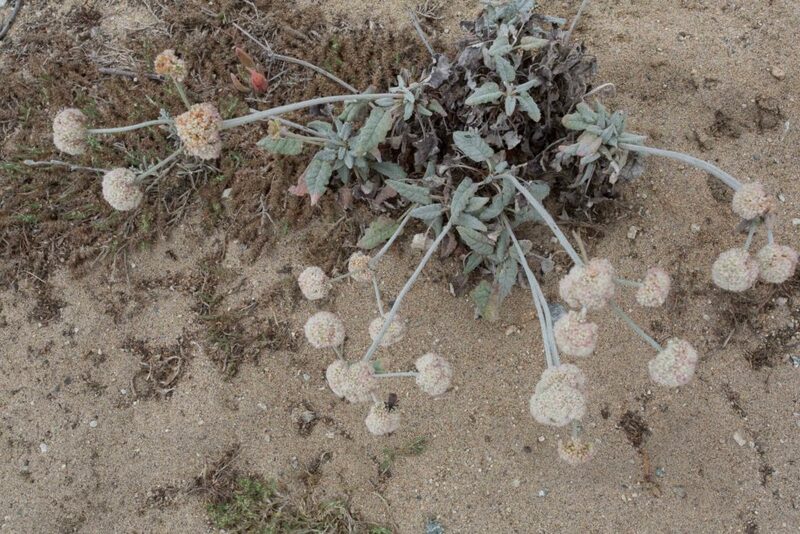 The flowers are likewise very small in small spherical clusters generally at the stem tips. 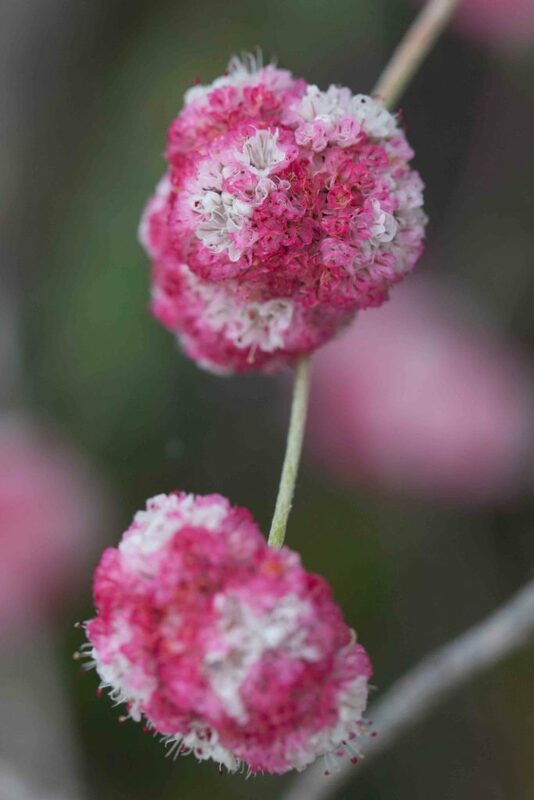 This is common with tall, leafless stems, each topped with rounded clusters of white or pale pink or yellow flowers. 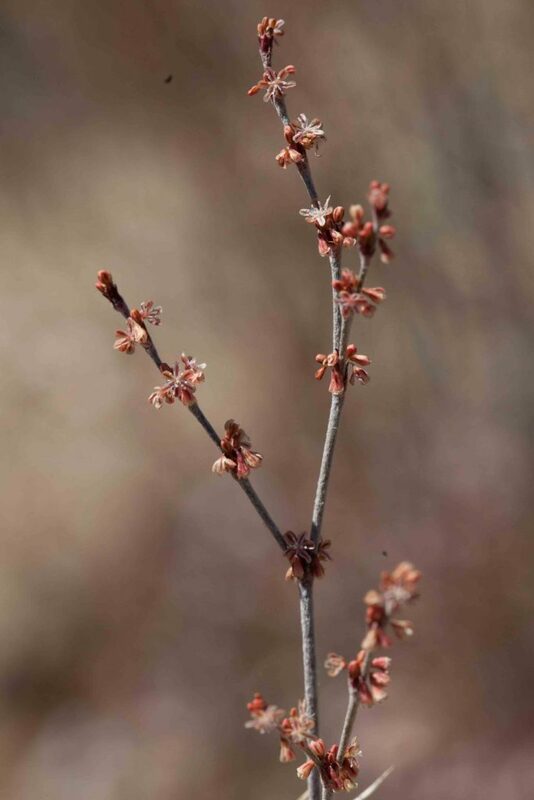 Leaves are basal or sheathing up the stem and noticeably wavy. 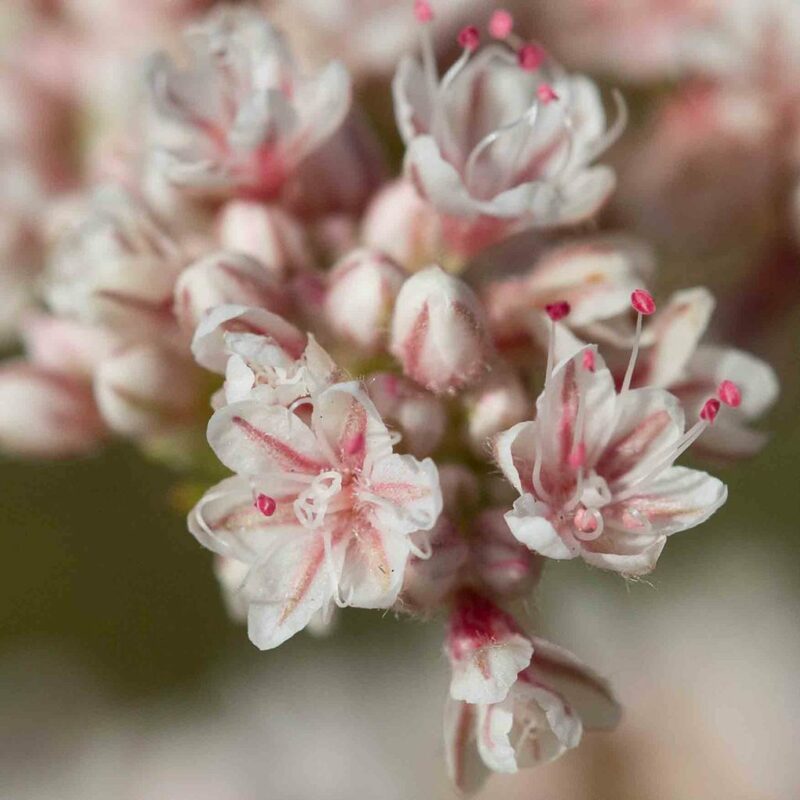 Stems are usually glabrous (hence the nudum in the scientific name) but can be hairy or even tomentose. They are hollow and can be slightly inflated, the bulging easily visible to the naked eye. 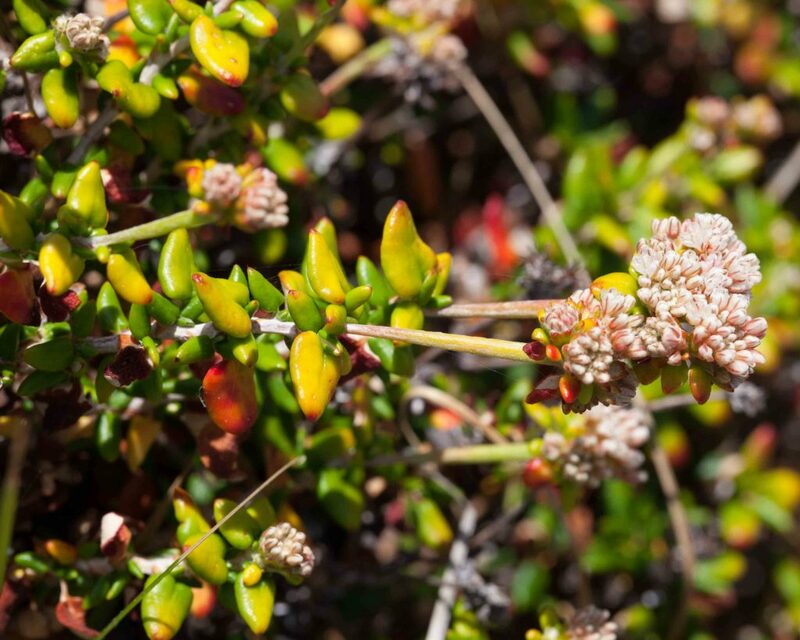 This common shrub comes in two rather different forms. 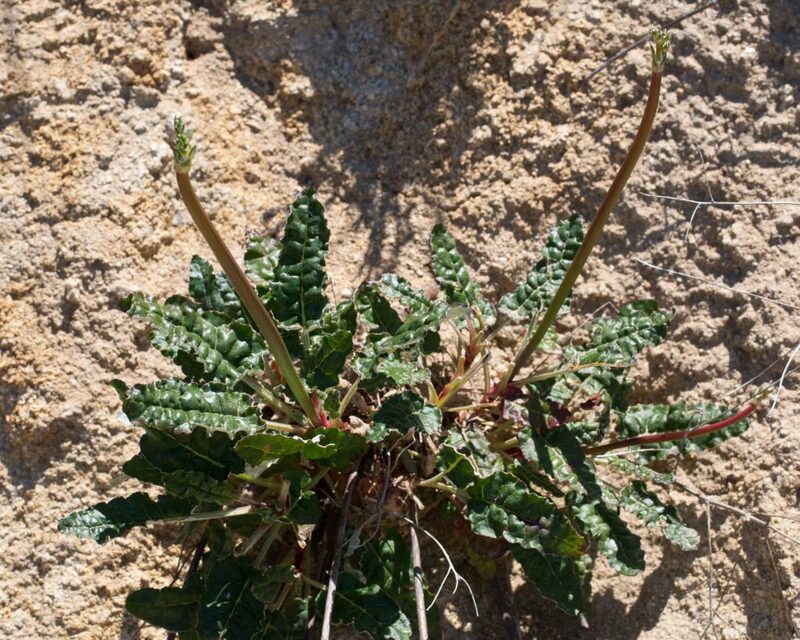 By the immediate coast it has smallish, fleshy leaves, glabrous above and tomentose below. Away from teh coast, leaves are not fleshy and often slightly woolly above. 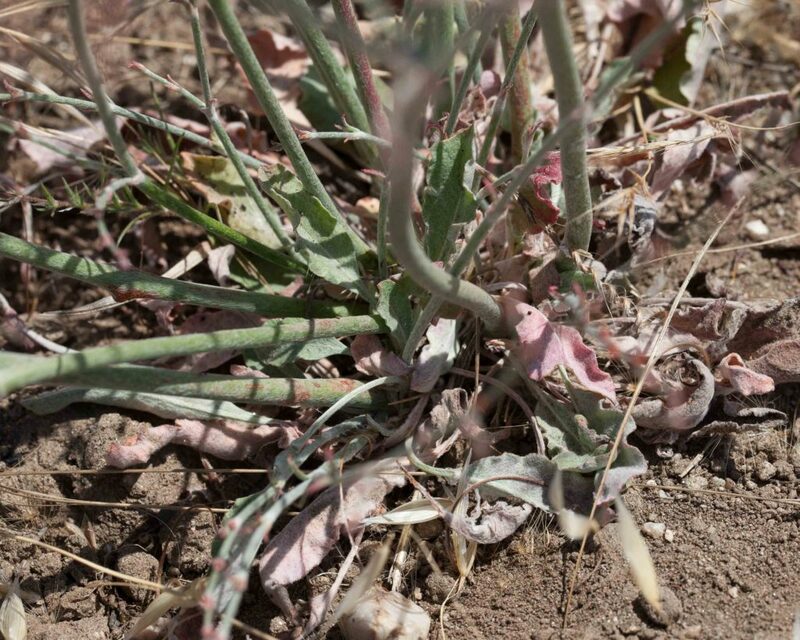 Leaves are clustered, lanceolate to round. 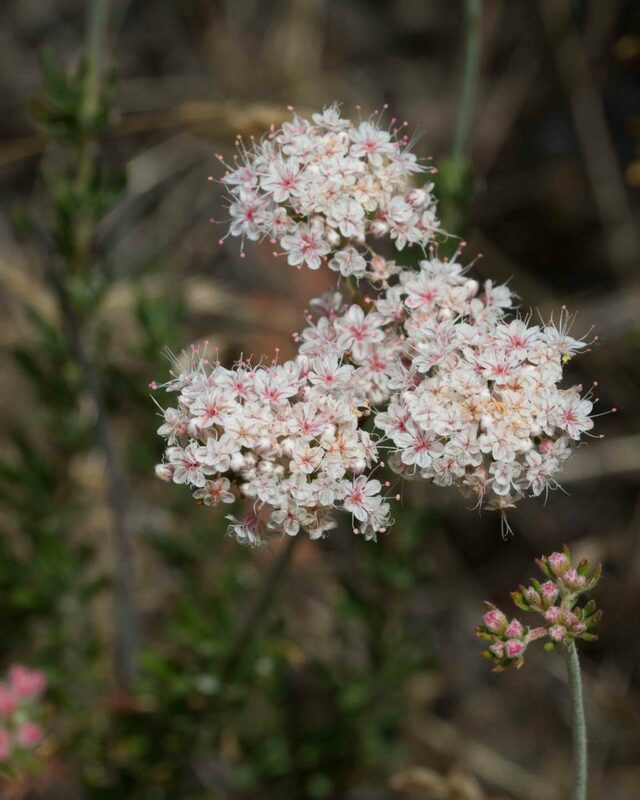 Flowers (except for the hairy base of the filaments) are glabrous, white to pink, often in the same cluster. 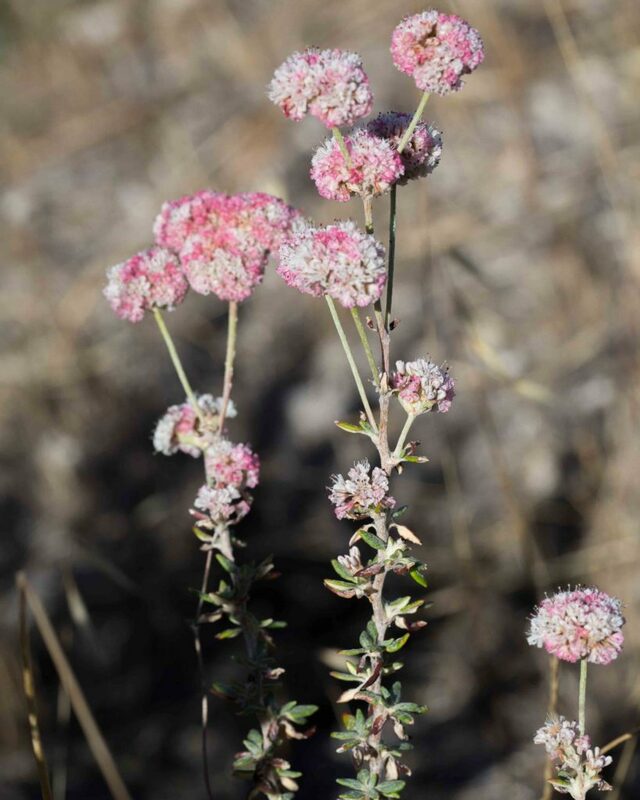 The inland form may be mistaken for Leafy California Buckwheat (Eriogonum fasciculatum) except for the different leaf shape (lanceolate rather than linear to oblanceolate) and the glabrous flowers.